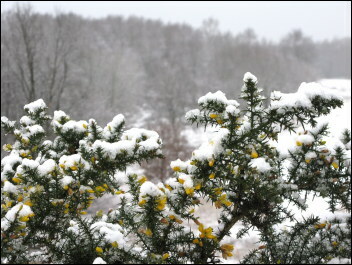 This week the early flowering snowdrops and gorse have been covered by several inches of snow topped off with frost. These stunning arctic conditions always remind me of the pristine beauty of Spitsbergen with the only missing ingredient being Polar Bears so this weeks gallery is a short selection of photos I took when I was last there in 2009. According to some predictions there will be no Polar Bears left in twenty years time so now is the time to start saving up to go before it is too late- sailing through the Arctic pack-ice at mid night is an experience that is impossible to describe. The Big garden birdwatch last weekend was a disappointment in respect of the number of birds in the garden. The surprise birds were a Grey Wagtail, feeding on the lawn, and a Nuthatch, neither of which are common birds in our garden. Although numbers were down we did reach 20 species which was respectable on a mild day.